I am a photographic artist, interested between the relationship between photography and archaeology. For this a-n New Collaborative Bursary project I am collaborating with Keir Stickland, an archaeologist working in the Department of Archaeology at Orkney College. Keir’s primary research interests are the collapse of complex societies, landscape abandonment, and the archaeology of islands. Together we will conduct an archaeological survey of the abandoned island of Swona, off the coast of Orkney. Keir is interested in making a full archaeological survey of the abandonment on the island, which was last inhabited in 1974. This New Collaboration Bursary is funding an initial research trip to the island in August 2014. Whilst Keir carries out an initial archaeological survey of selected dwellings over a one week period, I will conduct my own photographic survey. My art practice explores home, the poetics of space place and memory. Last year I worked as an Artist is Residence at a longhouse excavation in the Highlands. I am interested in the parallels of the process of excavation, of peeling back the layers of earth to reveal evidence of the past and the indexical quality of a photograph to record reality. During this initial research trip to the island of Swona I will visit the site to document the abandoned houses, capturing clues about the old residents from the belongings left behind, using photography and video. I propose to make a new body of work on the island of Swona exploring the archeology of abandonment. Taking into account the specifics of this story: the hurried abandonment, the intimate size of the island, the proximity to the restless sea, and of nature taking over the domestic spaces. This bursary is allowing me to begin the process of a new type of collaborative practice with a specialist from a completely different discipline: archaeology. I discovered a link with my practice and the process of archaeology during a residency I undertook last summer at the Timespan Heritage Museum in Scotland. 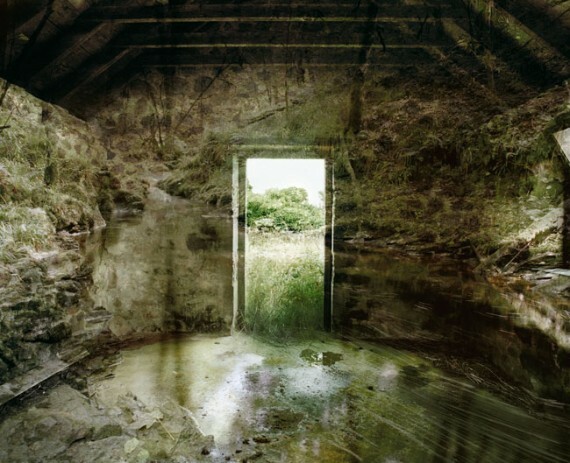 Timespan organised an excavation and invited me to be an Artist in Residence during the excavation because of my interest in the home and abandonment in my previous projects. This new collaborative bursary opportunity is enabling me to continue this research stream and work together with an archaeologist to create a joint survey of the site of Swona: exploring the archaeology of abandonment, through a traditional archaeological survey and visual art response. The first being far more about absolute measurements, mapping and plans, with the second concentrating on the emotion and perspective of abandonment. Carolyn Lefley is a photographic artist, educator and writer. Her photographic work explores notions of home, place, belonging, belief and folklore. Carolyn studied Fine Art at Coventry University and returned to London to complete her MA in Photography at the University of West London. She has been a Lecturer in Photography at the University of Hertfordshire, Coventry University, Anglia Ruskin University and the University of the Arts London.